Image credit: US Department of Defense, Wikipedia. 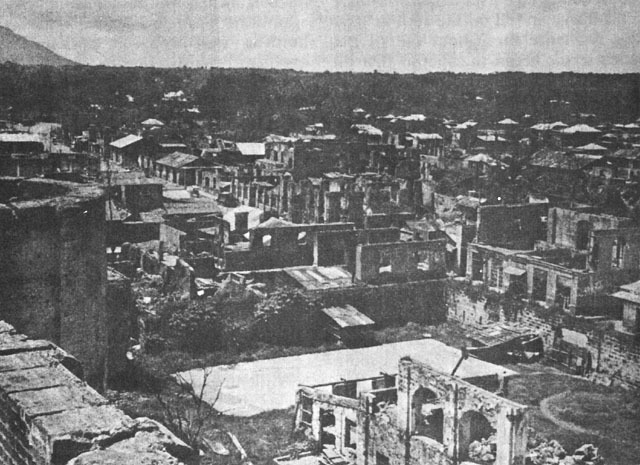 Lipa after bombardment in WWII. With Manila secured, Allied Forces intensified their efforts to secure Southern Luzon, including the Province of Batangas. The Japanese defense of Batangas was under the command of a Colonel Fujishige, a total of some 13,000 men called the “Fuji Force.” Of these, however, no more than 3,000 were effectively trained infantrymen. Thus, Fujishige laid his forces across the northeast from Los Baños in Laguna to Sto. Tomas, Batangas’ northernmost municipality. He also stationed troops in Tanauan to prevent Allied Forces from entering Batangas from Tagaytay Ridge, which the latter had secured after the virtually unopposed landing in Nasugbu late in January of the same year. To protect the Japanese Army’s southern flank in Batangas, Fujishige also stationed forces from Mt. Maculot in Cuenca all the way southeast along what is presently known as the JP Laurel National Highway from Batangas City going north to Lipa. This was to secure Batangas against any possible landing of Allied Forces on the shores of Batangas Bay. The 158th Regimental Combat Team (RCT) started moving out from Nasugbu on the fourth of March to execute one arm of the “pincer movement” that American strategists wanted to employ to liberate Batangas. This military strategy is a two-pronged attack on enemy forces to envelop them and attack them from two opposing sides.4 The group liberated Balayan on the same day and started to move southwards, meeting little opposition along the way. By 11 March, the RCT had reached the outskirts of the town of Batangas and proceeded to clear the Calumpang Peninsula, which separates Balayan Bay from Batangas Bay, of Japanese forces. The clearing operations successfully ended on 16 March. Meanwhile, on 7 March, the northern arm of the pincer movement required the 187th Glider Infantry of the United States army to descend from Tagaytay Ridge and move into Tanauan. Initially, the group met no resistance but finally came into Fuji Force defensive positions on 8 March two miles to the west of Tanauan. Seven miles north of Sto. Tomas, in a barrio called Real, the 511th Infantry had assembled. After encountering stiff Japanese resistance at Mt. Bijiang, one of the peaks of Mt. Makiling, its personnel started to move south into Sto. Tomas. Both the 187th and the 511th, however, were outnumbered by the Japanese defenders, but they still provided strong intelligence information for aerial and artillery bombardment of Japanese positions in the area. The 158th RCT finally started to meet strong Japanese opposition in Cuenca and Mt. Maculot on 19 March. For five days, the RCT engaged the Fuji Force in what would be remembered as one of the bloodiest and most vicious battles in the Western Pacific Theater of War, without making real progress. Because Manila had already been liberated, General Walter Krueger5, Commander of the United States Sixth Army which was doing the campaign in Luzon, was able to divert some of the troops used in the Battle of Manila down to the south. On 23 March, the 1st Cavalry Division, which had been enjoying a 10-day break after the fighting in Manila, relieved Allied Forces in the Tanauan-Sto. Tomas area. That same day, the 11th Airborne Division relieved troops of the 158th RCT engaging the Fuji Force in Cuenca and Mt. Maculot. 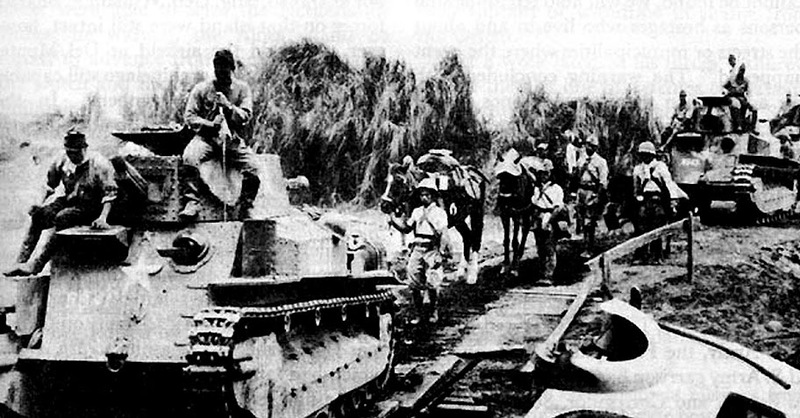 With fresher troops and reinforced by tanks, Filipino guerrillas and artillery fire, Allied forces were able to engage the Japanese in the Cuenca-Maculot area and still move on towards Lipa on 26 March. They were momentarily held up by Japanese forces based at the Lipa Airfield, or what would become Fernando Air Base. It did not take long for these forces to overcome Japanese positions because the latter had already started to withdraw to Mt. Malepunyo, anyway. As they did so, the Japanese burned the town and slaughtered Filipino civilians along the way, in total massacring an estimated 25,000 Batangueños, most of whom were from Lipa. Meanwhile, the capture of Lipa Air Base meant that the Allied forces would soon have a launching point for aerial assaults on Japanese positions. From the north of the province, Allied forces were also making good progress. Sto. Tomas fell on 24 March while Tanauan followed suit two days later. Japanese resistance started to crumble after the capture of these two towns and Allied forces moved south to complete the pincer movement with the capture of Lipa on 29 March. Lipa by this time was barely recognizable from what it used to be. While the Japanese burned it while they retreated to Mt. 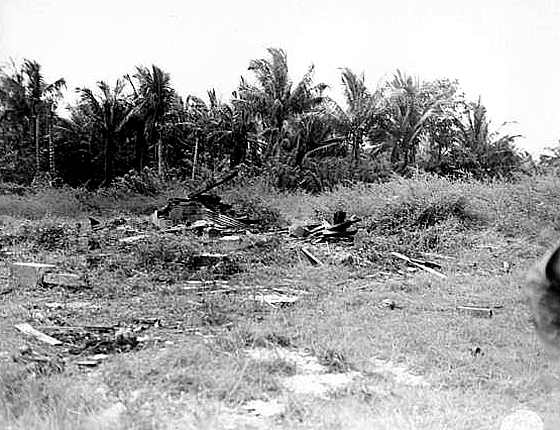 Malepunyo, in fact the town had been practically reduced to rubbles by American planes raiding from off aircraft carriers to soften Japanese positions for invasion. With Allied forces from the north reunited with those moving from the west, and with Japanese resistance in the province for all intents and purposes broken, the majority of the fighting forces available were sent back to Cuenca and Mt. Maculot to finally end the troublesome Japanese resistance in the area. This was not accomplished until 21 April, by which time the entirety of the Province of Batangas had already been liberated from Japanese occupation. Allied Forces could then move on to liberate Quezon and the Bicol peninsula. 1 “Battle of Manila (1945)” Wikipedia. 2 “Outflank,” online at the Longman Dictionary of Contemporary English. 3 “Malepunyo Mountain Range,” Wikipedia. 6 Most of the military details of the liberation of Batangas were from the book “US Army in World War II, The War in the Pacific, Triumph in the Philippines” by Robert Ross Smith, published in 1993 by the Office of the Chief of Military History, Department of the Army, Washington D.C.